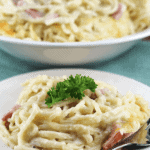 Linguine Casserole ~ Stuffed with Ham, Swiss Cheese and Linguine! The ultimate comfort food! Meanwhile, in a bowl, combine the ham, 1 1/2 c. cheese, soup, sour cream, garlic and onion. Drain pasta; add to ham mixture and stir to coat. Transfer to a 13 in x 9 in baking dish coated with cooking spray. Cover and bake at 350 degrees for 35 minutes. Uncover; sprinkle with remaining cheese. Bake 10-15 minutes longer or until cheese is melted.